I've got to say that I was so excited to read this book as the premise sounds fantastic. While it was easily readable I've got to say it really wasn't for me. 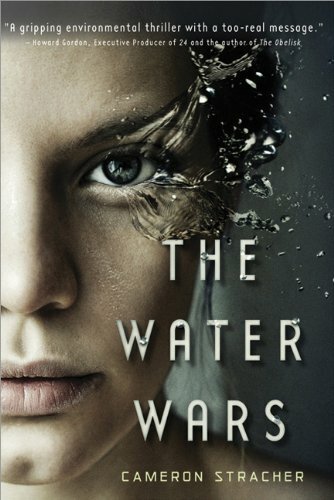 The main storyline is a really interesting idea - the premise is that water has become so scare it is a rare an valuable commodity - and it would appeal to people who were interested in environmental issues. The story itself rocketed along and I found that I finished it quickly and was quite engaged with it as the plot unfolded. I found the characters to be a little shallow, by which I mean I didn't really warm to any of the characters at all and I would have liked them to have been developed a bit more so that I could have warmed to them. I also found that because of this I didn't really get why they were doing the things they were (especially Vera and Will for someone they didn't even really know). While they were older teenagers I found that I saw them in my head as much younger in how they were portrayed. I also found the storyline itself to be both a bit too epic while being a bit too rushed in places. Suddenly characters were in situations and I found myself having to flick backwards to reread passages to find out how they had got there. All in all not a bad book but not an amazing one either. I think it would be a fab introduction for younger readers to dystopian fiction. I definitely want to read this book. The premise alone is awesome. It's a bummer about the characters! Thanks for the review. I bought this ebook over Christmas but haven't had a chance to read it yet. I have read a lot of varying reviews so I have kind of been putting it off. Thanks for your honest review! This one sounded so good as well from the description, maybe It's one to leave for now. Do you spoil it for everyone else?? Random House Children's Books Blogger Brunch.